(Estestvennye i Tekhnicheskie Nauki, ISSN 1684-2626) 2004, Iss.2, pp. 143-145. I show in this article that among hominoid tracks in the Himalayas it is possible to specify a group of prints possessing some typical attributes. They have well defining features ¾ small, about 20 - 23 cm long, and wide feet, big toe is short and thick. It departs sideways in the middle of sole like that of an anthropoid. Four others toes, rather short and equal in form, are widely placed in front part. Precise photo of a track of such type was taken by E.Cronin in 1972. Photos and descriptions of hominoid tracks in Himalayas present now the main data that permit to obtain some characteristics of these animals. The previous analysis of some footprints showed [1,2] that in Himalayas exists a population of large hominoids with specific features of feet. It is known also [3 and numerous observations] that hominoids of smaller size inhabit the region too. Selection of small footprints for analysis meets some difficulties. There are few images of small feet. Besides, it is necessary to ascertain and put aside the tracks that may be left by young animals of big hominoids. Below there are presented images of tracks that are definitely different from footprints of Shipton type. 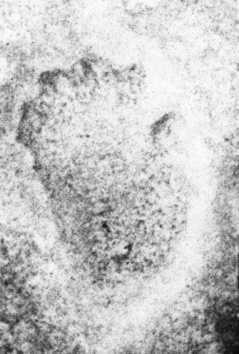 First of all let us pay attention to the photo of hominoid track taken by E.Cronin - Fig.1. Fig.1. Photo of the track of a Himalayan hominoid taken by E.Cronin. This image was received under the following circumstances. In 1972 in high mountainous and remote parts of Arun Valley in eastern Nepal a wildlife expedition worked, headed by zoologist Edward Cronin. At December night small group of E.Cronin, physician H.Emery, and two Sherpa assistants had arranged a camp on a ridge of mountain Kongmaa La at about 12000 feet (3650 meters). Before sunrise H.Emery had left the tent and called excitedly. He saw traces of barefoot legs left by a biped creature at the night between their tents. The tracks were of 9 inches (23 cm) long and 4,75 inches (12 cm) wide. The prints displayed precise details. It is visible on the photo that the foot of the hominoid has short and thick big toe put aside to the sole. The other four quite short toes are located widely at front part of foot. The back part of the foot is a wide rounded heel. Members of the expedition had followed the tracks and found out that the creature approached the camp from the northern slope. From the camp the tracks continued onto the southern slope. Farther the hominoid came back onto the top of the ridge, crossing back and forth several times. Then the creature went down to the south slope where the tracks were ultimately lost in the bare rock and scrub. Cronin noted: "The creature must have been exceptionally strong to ascend this slope in these conditions. No human could have made overnight the length of tracks I could see from the top of the ridge." Comparing the images of hominoid tracks by Shipton and by Cronin one can see that they strikingly differ one from another by their structures. Instead of two huge toes and pair of small toes on Shipton tracks one see four of virtually identical small toes on that of Cronin. The big toe departing from middle of the foot on Cronin track has no correspondence in Shipton's at all. This feature relates the foot of Cronin type hominoid with grasping hind leg of anthropoids. A print of foot of the same type was found in Bhutan , Fig.2. Fig.2 A plaster cast of a hominoid footprint from Eastern Bhutan. The Bhutan cast had been found out by George Schaller at the exhibition stand in office of the Bhutan Department of forests, Thimphu. 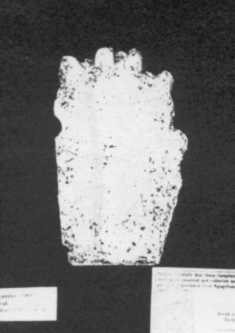 He had sent a black-and-white picture of this cast to cryptozoologist Dmitri Bayanov in Moscow who gave me the material for use in the research. Unfortunately, there is no data on size of this track, it is known only that the footstep was found out in Sarteng area in Eastern Bhutan. The Fig.2 shows that the foot has similar to Cronin's photo general appearance and position of four front toes. Its big toe departs sideways also and does not reach tips of other toes. In this case it clasped to the foot more tightly. "Tracks on lake did not exceed 20 cm in length. The distance between tracks was 35 cm and their way was quite straight. Accordingly to depth of prints the animal was large, but not huge. We have approximately defined its weight in 80 - 100 kg. In spite of wind and snow dropped between 18 and 23 of April had deformed them a little, it was possible to distinguish five toes. The big toe usually had been turned back and left deeper prints (underlined by me -M.T.). On two tracks I noticed on back part of heels triangular marks, apparently from bunches of hair…Then I had noticed three lines of tracks: one from moraines and two others from the valley. They met and further went together. It was such impression that only one animal moved on." This description is fully consistent with previous images. Considering foot of such type, it may be noted that, despite mobile big toe, the hind leg of the creature does not have abilities to grip such as anthropoids do. The front toes of such foot are too short to make whole envelop. However, foot of such kind is successfully used by the hominoids for confident moving on snow and rocks in high mountains. I thank Dmitri Bayanov and George Schaller for opportunity to use footprint images from Eastern Bhutan. 2. Trachtengerts M. Tracks of four-fingered Himalayan hominoids, "Natural and Technical Sciences" 2004, Iss.1, in Russian.